A shopping centre in Salisbury, which had been sealed off since a nerve agent attack in March, has been fully reopened to the public. The Maltings, where former Russian spy Sergei Skripal and his daughter Yulia were found slumped on a bench, has been "extensively" cleaned. All traces of nerve agent have been removed and the site "presents no risk to public health", officials said. Up to eight firms had been closed since the attack on 4 March. Alistair Cunningham, from Wiltshire Council, said the reopening was a "massive step" in the recovery of the city. "It has always been a priority to reopen this main economic thoroughfare, which takes visitors and shoppers from the main car parks to the city centre past the shops in the Maltings that have been directly affected," he added. "The Maltings site has undergone thorough testing and clean-up work by world-class specialists, and the public can be reassured that any traces of nerve agent that may have been present have been removed and the site presents no risk to public health. "I would urge people to visit and support the businesses in the Maltings, and the rest of Salisbury as the city recovers and gets back to normal." Audrey French, who manages the Naomi House hospice charity shop, said trade in the area had been "very, very quiet" and she hoped business would now "get back to normal". "Salisbury has suffered enough as it is, we need everybody to know that Salisbury is safe. "Nobody has been round here at all. It's been a long, long 11 weeks. It's been a real struggle," she said. 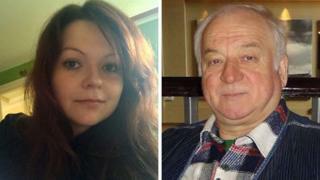 Sergei Skripal, 66, and his daughter Yulia, 33, were found unconscious on a bench, suffering from the effects of the nerve agent Novichok, on 4 March. Ms Skripal was discharged from Salisbury District Hospital in April, and her father earlier this month, following treatment. Defra announced last Monday it had handed back the area from government control following a huge decontamination operation.